Journalist, Robert Zeller from the Globe and Mail was one of the handful of reporters dispatched to cover Bauer in his inaugural Tour. His daily reports - were important reading, opening Canadian fans to the Tour and making Bauer an instant cycling hero. 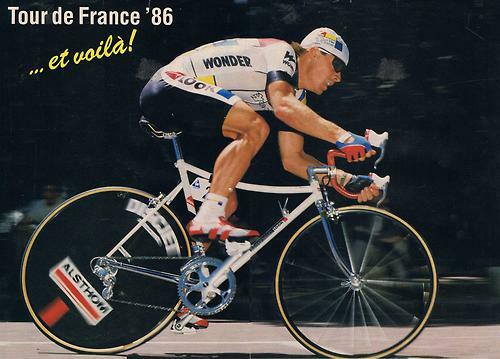 This is a superb image of Bauer riding one of the two TT stages during the 1986 Tour, his second year as a professional for La Vie Claire. He finished a solid 23rd overall.